G22 of the German Army with a fluted barrel. Closeup of PGW Timberwolf action with a helically fluted bolt. In firearms terminology, fluting refers to the removal of material from a cylindrical surface, usually creating grooves. This is most often the barrel of a rifle, though it may also refer to the cylinder of a revolver or the bolt of a bolt action rifle. In contrast to rifle barrels and revolver cylinders, rifle bolts are normally helically fluted, though helical fluting is sometimes also applied to rifle barrels. The main purpose of fluting is to reduce weight, and to a lesser extent increase rigidity for a given total weight or increase surface area to make the barrels less susceptible for overheating for a given total weight. 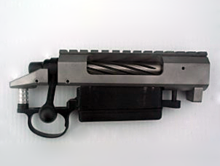 However, for a given diameter, while a fluted barrel may cool more quickly, a non-fluted barrel will be stiffer and be able to absorb a larger amount of total heat at the price of additional total weight. ^ ""The Real Benefits of Barrel Fluting" by Joel Avila, 1LT(P), EN, USAR, 12 August 2004". Archived from the original on 2014-10-24. Retrieved 2010-06-17. This page was last edited on 4 December 2018, at 01:39 (UTC).